(Nanowerk News) A team of Virginia Tech researchers has discovered a way to create hydrogen fuel using a biological method that greatly reduces the time and money it takes to produce the zero-emissions fuel. This method uses abundantly available corn stover - the stalks, cobs, and husks - to produce the hydrogen. The team's new findings, published Monday in the Proceedings of the National Academy of Sciences ("High-yield hydrogen production from biomass by in vitro metabolic engineering: Mixed sugars coutilization and kinetic modeling"), could help speed the widespread arrival of the hydrogen-powered vehicles in a way that is inexpensive and has extremely low carbon emissions. 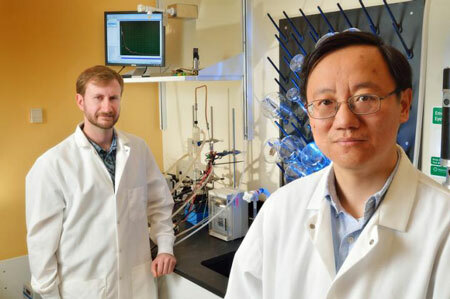 Virginia Tech professor Percival Zhang (right) and recent doctoral graduate Joe Rollin.